Horse racing and tragedy can be inevitable with animals weighing over a thousand pounds thundering down a dirt track together at speeds over 30 mph. At the storied Santa Anita Park racetrack this year, however, tragedy is becoming disturbingly typical. Lets Light the Way, a 4-year-old filly, had to be euthanized Monday after a training run gone horribly wrong at Santa Anita. Per Bloodhorse, she was the 21st horse that had to be put down during training or a race since the track’s racing season began on Dec. 26, a rate of one horse death every 3.3 days. According to the Los Angeles Times, only seven horses had died up to Feb. 26 at Santa Anita last year. Forty-four horses were eventually put down over the entire fiscal year, the lowest number in 25 years. The racetrack has responded by canceling races indefinitely on Tuesday, per the Times. What is happening at the Santa Anita racetrack? Such a death rate would be disturbing even at the most obscure of racing tracks, but it takes on a special gravitas at Santa Anita, especially when there’s a whole lot of racing left to be done there this year. Santa Anita is home to several major races each year, including one of the Kentucky Derby’s biggest tune-up races in the Santa Anita Derby. That race is scheduled to be run on April 6 this year, in just a month’s time. The 2019 Breeders’ Cup is also scheduled to take place there this November. Clearly, such a track being too dangerous to use would be a fiasco. So what’s causing this? The owner of Lets Light the Way theorizes it could be the extreme amount of rain hitting Southern California this winter. "My opinion is the problem is with the bad weather," McAnally said. "You can see on the news—some of the ground is separating and houses are falling off cliffs, almost like an earthquake. "Weather is the cause of all of this. I loved that filly. I bought her at the sale—liked the way she walked. I feel as bad as anybody, but that's the first I had (this meet). I wanted to cry when we had to put her down." One racetrack surfaces specialist that spoke to Bloodhorse said that he didn’t see any evidence of a problem with the track when he studied it last week. Frequent horse deaths have been plaguing Santa Anita for weeks, to the point that the main track was actually shut down last week for two days to evaluate the problem. 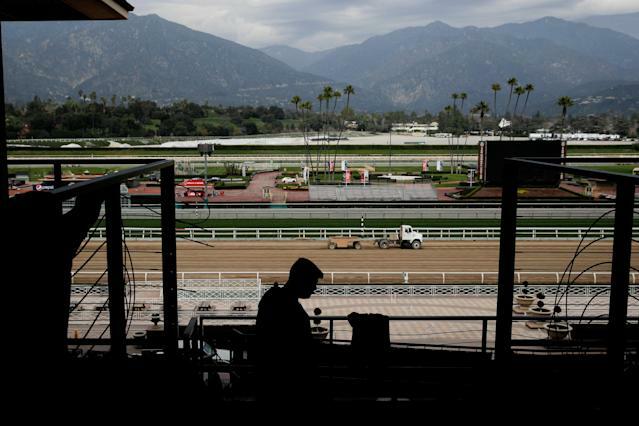 Since the issue clearly remains, Santa Anita announced Tuesday that it was hiring former track superintendent Dennis Moore as a consultant. The California Horse Racing Board could also get involved. In a statement released to Bloodhorse, the CHRB said it has been in contact with Santa Anita over the situation and is “now examining other options to prevent additional fatalities.” The board intends to discuss the fatalities at Santa Anita during its next meeting on March 21.